If you're looking to do the same, my advice is to first make an appointment through your local consulate, and then start collecting documents. I returned home to the USA at the end of July, thinking I could apply for the visa near the start of August, thus returning to France at the end of August or early September. Then I logged in on a whim one day near the end of July, just to check out availability of appointments. The earliest appointment was... wait for it... September 1! So I immediately booked it, then felt silly for not having looked earlier in July while I was still in Europe. You definitely don't need an entire month to get the documents together. In fact, if you were super crunched, you could get all of the documents for this visa in a single day. Point being, make your appointment first. Then start getting the documents. Since I'm a resident of Wisconsin, my consulate is in Chicago. The requirements for that consulate are here. Requirements differ by consulate, so make sure you're applying at the right consulate, and following the requirements for your consulate's website, not any other. I'm not including links to these documents because I don't want to have outdated links when the forms are updated. Current links can be found on your Consulate's website. 1. One application form filled out completely and signed by the applicant. 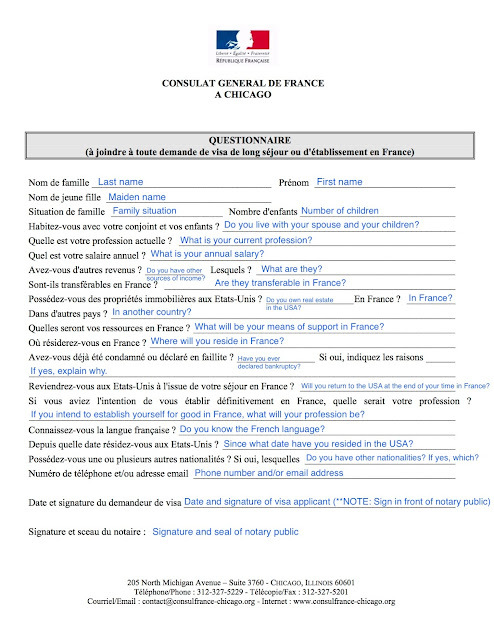 They have both the English and French applications online, so you can always use the English to help you fill out the French if you're not super confident. I used the French application, but it shouldn't matter which you turn in. I got these taken at Walgreens, where two is the minimum you can have taken (but the office only needs one). Simple. Again, follow the directions: no glasses, no hat, no smile. The only question that really tripped me up (and I'm still not certain about) is on the eighth line: Ils sont transférables en France? The questions before are asking about your annual salary, and other means of income. Then, this question asks if they're "transferable in France," whatever that means. At first I wrote Non, since I'm not planning to open a bank account there and transfer any money in. But in my second (and final) time filling this out, I wrote "Oui," interpreting it as "Can you spend this income in France?" which I will be able to do. That seems to make the most sense as far as the meaning of the question. Don't forget to have your signature notarized on this form! I almost didn't realize it, since it's the very last line—in French—and not mentioned elsewhere on the site, but you do need to have it notarized. That means, don't sign the form until you have a notary public watching you do so! Then they'll sign the document and seal it with their special stamp. 4. Original passport or travel document (+ one photocopy of the identity pages). Your passport must have been issued less than 10 years ago, be valid for at least three months after your return to the US and have at least 2 blank visas pages left. Make sure your passport meets the requirements. I read some things about one visa office not liking a color copy of someone's passport page, so I purposefully made a regular black and white copy. They happily accepted this. You'll leave your passport in the visa office, and they'll mail it back in the prepaid envelope that you'll buy (#15)—either with a visa, or without. 5. Status in the US - If you are not a US citizen, copy of your green card or visa. I wrote a short letter that said something fancy like "I hereby declare that I, [First name Last name], am a citizen of the United States. My passport number is #######, which was issued on such and such a date and expires on this other date." 6. Letter explaining what you intend on doing in France. Mine was a full-page letter, though I've read of others who wrote a simple paragraph, and that was enough. 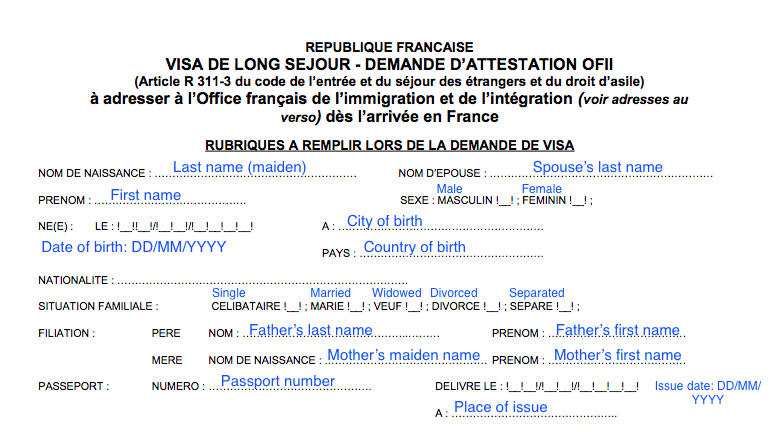 It simply took that amount of space for me to explain my various reasons for seeking a long-term visa: to learn French, to understand French culture at a deeper level, because I prefer slow travel, to give me more topics to write about, because my freelancing allows it, to be able to provide more insight to French posts at my editing job, etc. I wrote my letter in English, if anyone's wondering. I drafted another short letter with the simple statement: "I, [First name Last name], promise not to engage in any employment in France. Here's the second document where you'll need to hold off on signing until you have a notary public watching you, and then they'll notarize the letter. That part again is absolutely necessary, so ask around—someone you know will know a notary public. I drafted up a letter for my boss to sign, which simply stated my position, my hourly wage, how many hours I work a week, and then what that comes out to monthly. In addition to this letter, I included Paypal printouts that showed my earnings from this job since January 2015 as extra proof (since I get paid via Paypal). I headed this section with a simple one-page summary to make sense of the documents that would follow. It listed the amount currently in each of my bank accounts, and that total. In another section I listed my minimum and maximum monthly income (depending on how many hours I work, since it changes and is flexible). Then, I divided my total savings/checking amount by 12 to get a monthly amount. I showed monthly savings + monthly income = amount of disposable money monthly in France (min and max). Both of those amounts were over $3,000. I'd heard you need to prove that you have between $2,000-$3,000/month (even though I live on way way less! ), so I think I was set. For proof, I printed out the last three months of statements online for each of my accounts—savings and two checking accounts, plus got a letter from one of my banks (that bank is virtual—Capital One 360—and I had this letter with a single click) confirming my current balance, the average in the last year, and average in the last three months. I also printed out my Roth IRA balance as back-up. They want to be sure that you didn't transfer money in from somewhere else just for the appointment, so make sure you prove that you've had your savings for a while if that's what you'll be using (the past 3 months of bank statements should show this, though I read about one guy who had to show statements for the past year). I'd provided 4 months of statements for the Capital One 360 accounts, but she handed me back that fourth statement and didn't include it with my application. 10. Proof of medical insurance : you must bring proof of a valid overseas medical insurance with a minimum coverage of 50,000 US for emergencies and repatriation and NO deductible or co-pay. The letter provided by your insurance company MUST clearly state these conditions. I got frustrated by this one, because I wouldn't need a yearlong overseas medical insurance policy if my visa got denied, would I? And the best (aka cheapest) policy I could find only had a 10-day cancellation policy. In the end, I still went with them, buying my insurance from World Nomads. After purchasing the policy, I emailed World Nomads, and they responded that day with a letter that clearly stated the conditions mentioned on the visa website, using that exact language (minimum coverage of $50,000 USD for emergencies and repatriation, and no deductible or co-pay). So I printed the letter, and included it with my other medical insurance proof. 11. Marriage certificate or family book + Birth certificates for children - Didn't need this—no husband or children! 12. Enrollment in a school for the children. - I didn't need this either. I'd read of other people online who showed that they'd booked a hostel for a week, and printed out places on Airbnb to show places were available during their dates, and that they could afford it. I read the story of another person who needed to send a copy of her landlady's passport and a utility bill (after her visa appointment, in addition to the email she'd originally provided which stated their rental agreement). So, combining both of these situations, here's what I did: I had Damien write me a letter—one I drafted up in English, and then he wrote another in French—stating that I could stay with him (his parents' home) while I was looking for accommodation. I don't actually think I'll be staying there at all, but it was the type of proof I'd need for this part of the visa application. He and his parents all signed both versions of the letter, and then he sent along a utility bill with his name on it (for that address), plus a copy of his passport and a copy of his parents' French ID cards. I also then found a place available on Airbnb for 12 months in Montpellier, which was listed as 300 euros/month if you booked it for the whole year, and printed that out. During my appointment, she asked me why I'd included the Airbnb stuff. I said it was to show how much an apartment would cost, and to prove that I could afford it. (I didn't want to explain that I'd actually be looking for an apartment upon arrival; if she thinks I'm residing at Damien's parents' house all year—fine by me. The letter clearly stated otherwise in English and French). She then handed all of the Airbnb stuff back to me through the window, and only included the letters/IDs/utility bill from Damien and family. Alrighty then. This changed the day before my appointment (from $109 to $111), so be sure and check for the current amount. Chicago's fee page is updated on the 1st and 16th of every month, so check after those dates—whichever is closest to your appointment. You have to pay in cash—no change provided—so make sure you have exact change. This was a pretty simple form. She slipped it into my prepaid envelope during the appointment, because I'll have to take it with me and fill out the bottom half upon arrival (and then I'll get to do more paperwork/residency appointment joy). Since it's all in French, I'm including the translations here, for anyone who doesn't speak French (yet)! 15. A self-addressed prepaid EXPRESS MAIL envelope from the US POST OFFICE ONLY - NO FEDEX / UPS / AIRBORNE EXPRESS accepted. Follow the directions completely, here. I read from it to my post office lady, and she grabbed an envelope and a form, then before I knew it she'd peeled something off and I shouted "No!" I said, "We can't put that on." "It says here: 'Please do NOT stick the mailing label on the envelope and fill out as follows'"
So she trashed that one and grabbed a new form. Fill it out as directed, but DO NOT take it off the sticker. Slip it inside the envelope for safe keeping. My prepaid envelope cost $19.99. With all of the above documents in hand—well, in my backpack—I hopped on a bus to Chicago the night before, to ensure I'd be on time (and stress-free) for my 11:10 appointment the following morning. When you make the appointment, you get a form to print out (with a barcode), that you have to show to security in the building lobby on Michigan Avenue (along with your passport). They'll then give you a small pass with another barcode, which you scan to get access to the elevators. That original appointment confirmation sheet says to only come at your scheduled time, so I actually didn't get there too early, but maybe I would have gone in a tad earlier next time. When you get to the small visa room, there's a sign up at the front saying to put your little tag (what you scanned to access the escalators) on the counter in the middle of the two windows. So I dropped mine in there and had a seat with everyone else. This was around 11 o'clock. My name didn't get called until 11:55 or so; I'm not sure if they normally get that far behind or not. I handed over my stack of documents underneath the window, and she just started looking at everything closely. At some point after my first tab, she said "You're very organized. It really helps," and then she continued looking down at my documents in silence. I gladly took that as a good sign. She handed back a few documents (the ones I mentioned above) during the 10 or so minutes she spent looking through my stuff. Then I handed over my cash to pay, and she had me double check the info on the receipt that she printed out. Next came some electronic fingerprints: left fingers, right fingers and lastly the thumbs. When I was all done, she asked me, "When are you leaving? It's October 1, right?" I just said "Yes," even though I hadn't bought a plane ticket yet (Why on earth would you buy a ticket if you don't yet know if you have the visa?! ), to which she replied "Okay, well this should come back in about one week." So, I'm taking that as a very positive sign, but still won't buy a plane ticket until I have the visa for sure. I'd been planning to catch the 12:30 Van Galder back to Madison, so I really had to hurry to make it on time. I left the consulate around 12:12 and speed walked 15 blocks to Union Station on Canal and Jackson. I made the bus! But didn't have time to grab lunch for the 4-hour ride... Oh well. I felt so relived from finally turning in all my documents. Now I'm just waiting for that envelope to arrive in the mail to find out if I got it or not! So while we're waiting, just like with my last Spain visa, I want to do a summary of the cost. Of course, if you don't include the medical insurance, you're down to $235.03, but since the insurance is a requirement to apply, I thought it made sense to include it. Cross your fingers for me—I'll update this as soon as I have news either way! Update: 9/12/15: My visa came in the mail today! I got it! 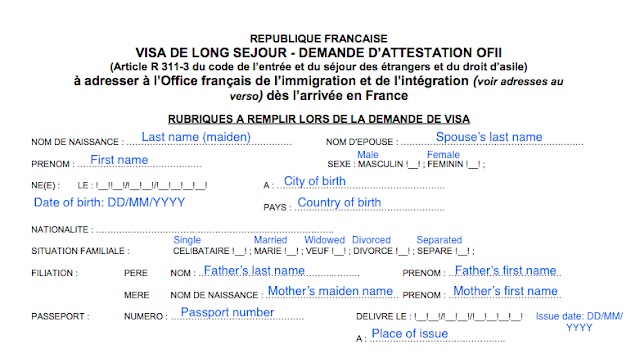 Update 2/2/16: Here's the second half of this process—my appointment in Montpellier to validate my visa for the full year.